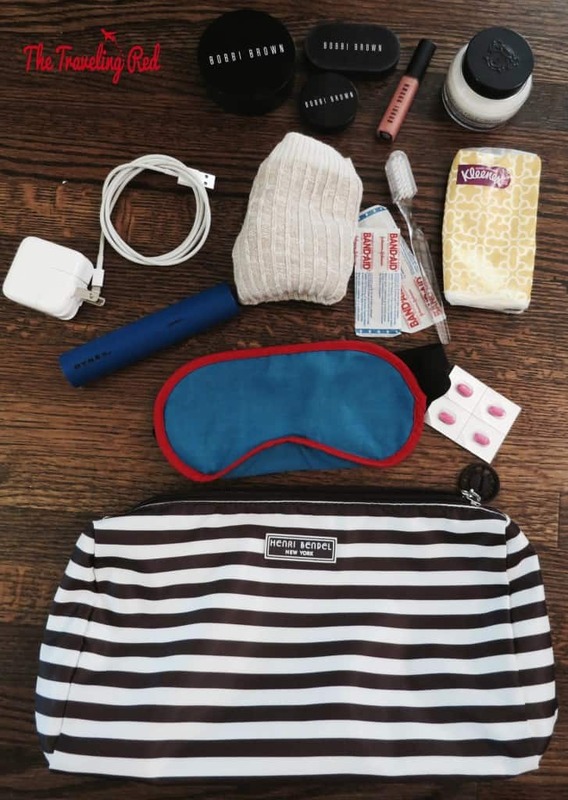 What do you need to carry-on with you for a long flight? And when I say a long flight, I mean a really long flight. Like 10 hours and up. I always check in my luggage and carry-on a duffle bag with my valuables, my pre-packed travel kit for long flights, and of course some entertainment (my iPad, headphones, a book, etc). As soon as I get on the plane, I pull my travel kit out of my duffle bag and leave it on the floor in front of my seat and then put my duffle bag in the overhead compartment. This allows for me to have everything I need without having to get up continuously, while maintaining the most legroom possible. 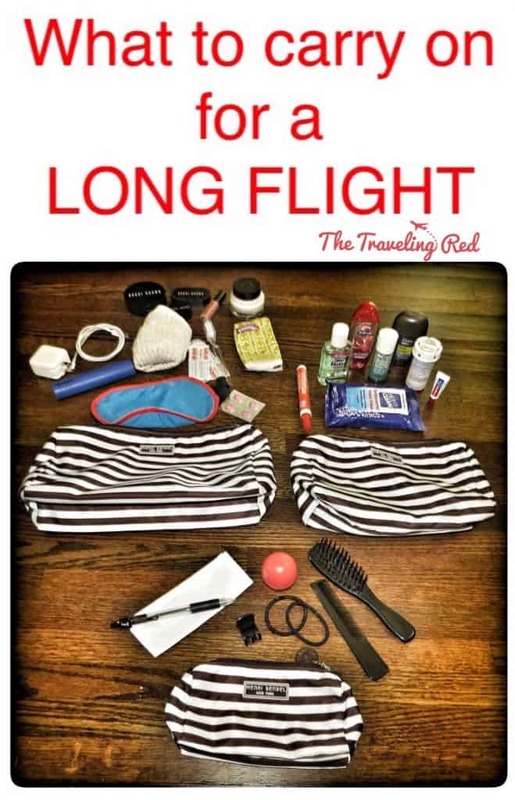 Some years ago, I bought a bunch of travel size items and packed a small travel kit with the essentials for long flights. Ever since, my travel kit has remained packed and I just update it as necessary. Having all of these items ready to go makes my life so much easier when it’s time to pack. 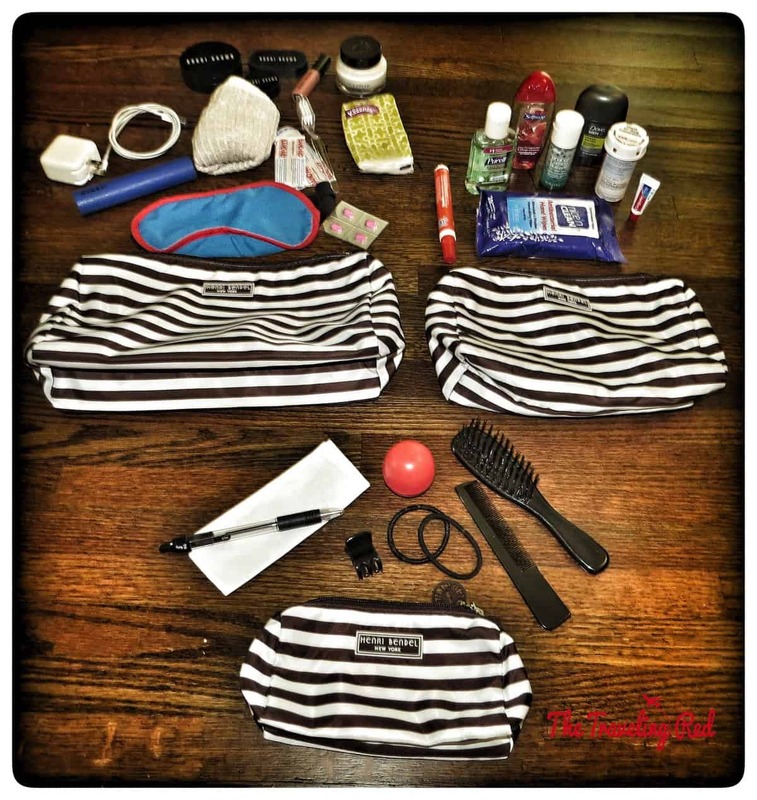 I love my travel kit because it consists of 3 separate bags (it helps me keep it semi-organized!) that fit one into the other. It ends up being just 1 bag that I pull out when I get on the plane. 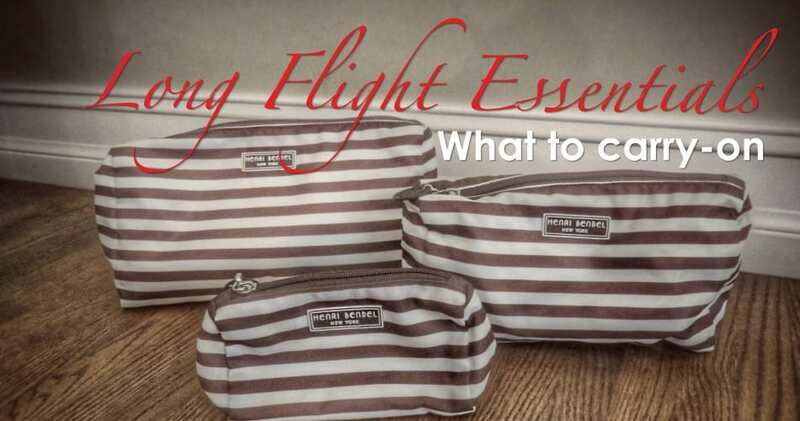 Travel Bags: I found these Henri Bendel travel bags that come in a set of 3 and are super light-weight, easy to wipe down, and best of all they fit one inside the other. I pack the 3 separate bags based on the type on contents, then drop the 2 smaller ones into the bigger one, take the air out of it and drop it into my duffle bag. 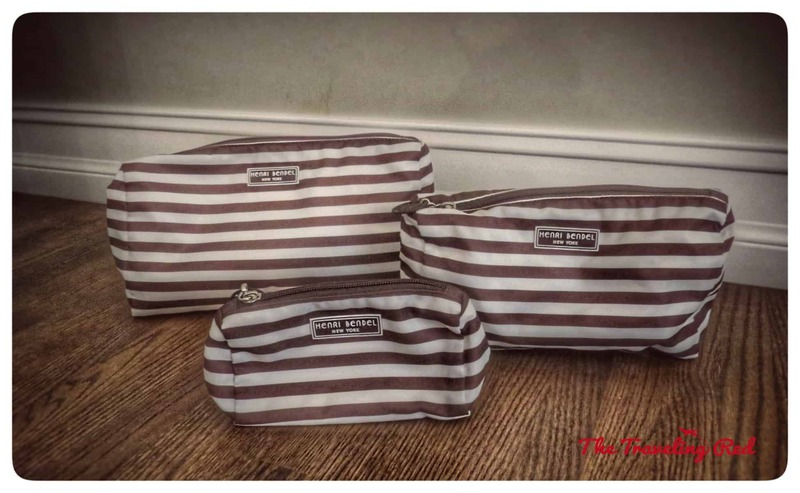 Here’s the link to purchase them: Henri Bendel Packable Travel Trio. Lip Balm: Your lips always get super dry on long flights. Pen: You need this to fill out all of the immigration forms. Photocopy of your passport: You can leave your passport safely put away in your bag and you still have all of your passport information handy when you fill out the immigration forms. 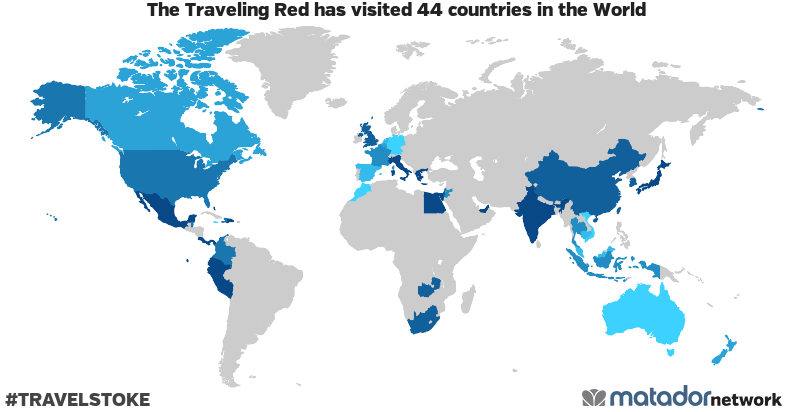 Also, you should always carry a copy of your passport anyway in case you lose it while abroad. I keep 1 copy in my travel kit and a second copy in my husbands wallet, just in case. Antibacterial Wipes: I’m a clean freak so I wipe down everything around me as soon as I get on the plane to avoid getting sick. Medication: Any medication that you take regularly should be with you at all times. You might want to also carry something that helps you sleep. It’ll make your long flight go by much quicker. Body Wash: If I have a long layover between flights, I like to take a quick shower. Most international terminals have shower that you can use (but you might have to pay for it). I have done flights that are 30+ hours total, so a shower is a must during my layover. Deodorant: You need this if you shower and even if you don’t get to shower, baby wipes and fresh deodorant will make you feel better. Face Wash: Even if I don’t get to shower during my layover, I like to go to the bathroom to wash my face, reapply moisturizer (planes make you so dry) and a little bit of fresh makeup. It makes me feel so much better. Toothpaste: Because no one likes dragon breath. 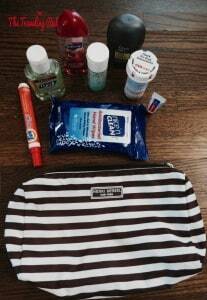 Toothbrush: If you’re flying business or first, this is usually provided. Socks: I’m always freezing on planes so I wear a sweater and take big socks in my travel kit to keep me warm. This will also be provided if you’re flying business or first class. Moisturizer: I apply some after washing my face to keep my skin hydrated. Phone Charger: You need a phone charger! You can charge your phone at the airport (you might need to carry an adapter as well) and a lot of flights have outlets at your seat. Portable Battery Charger: The random blue thing in the picture, is a portable charger. I charge it up before leaving home and if there’s nowhere to charge my phone, then I plug my iphone cable into the blue charger and charge up my phone for another full charge. If you’re doing 30 hours of flight time, trust me you’ll appreciate this thing if your flight doesn’t have outlets. Cell Phone: Once I get on the plane, my cell phone gets added to this bag so I don’t lose it but I have it accessible. Mints and/or Gum: Especially gum for takeoff if you have sensitive ears. Sleep Mask: I never use these things, except for on long flights. You might just be lucky enough to have that guy nearby that wants to have his window open the whole time with tons of sunlight coming in. Just in case, I bring mine to ensure that I can sleep (at least a bit). This is also provided if you’re flying business or first class. Makeup: Just some basic makeup to reapply. Clean Undergarments: If you get the chance to shower, then carry clean undergarments with you. Even if you don’t change your whole outfit, you’ll feel clean again. If you want to change completely, then add a clean outfit to your duffle bag. Band-Aids: I always have a couple with me, just in case. Tissues: These are great for anything, a runny nose, gum you don’t want to chew anymore, etc. I know it sounds like a ton of stuff, and you obviously don’t have to carry the exact same things, but it’s worth being prepared. Hopefully this makes your extra long flight a little more bearable. part 🙂 I look after such information much. I was seeking this particular information for a very long time. It’s simple, yet effective. A great deal of times it’s very hard to get that “perfect balance” between usability and appearance. I must say that you’ve done a awesome job with this particular. So glad you found it useful!